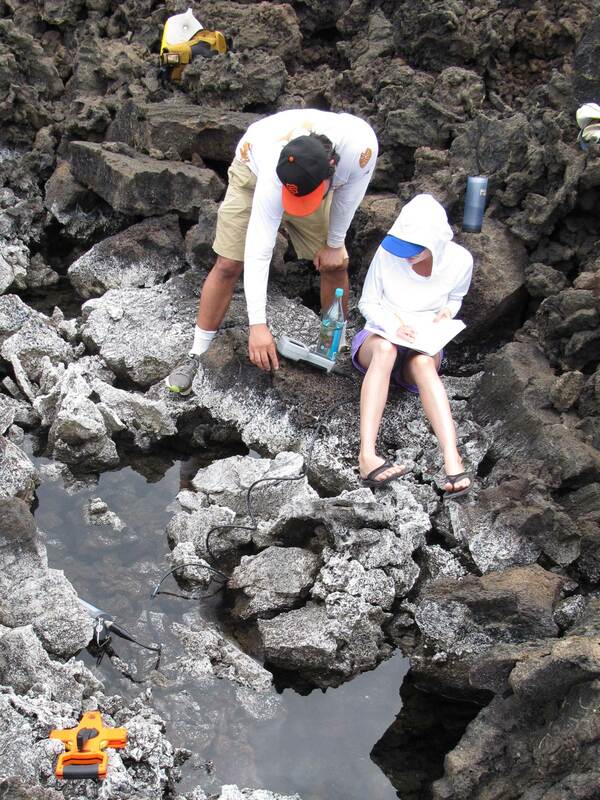 Graduate student Lisa Marrack studies collects samples from one of over 450 groundwater fed brackish anchialine pools surveyed on the Island of Hawaii as part of her dissertation work. Photo courtesy of Lisa Marrack. disciplinary education in relevant fields supplemented with exposure to cross-disciplinary communication and problem solving. The Ph.D. program consists of four interrelated components: disciplinary emphasis, an area of specialization, research methods, and breadth requirement. The course work program is developed by the Guiding Committee in conjunction with the student’s needs and interests and approved by the Graduate Advisor to assure that it provides preparation for the qualifying examination and the research program. Disciplinary Emphasis. The disciplinary emphasis focuses on the broadest academic area from ESPM’s three divisions-- Ecosystem Sciences, Organisms & Environment, Society & Environment—that encompasses the student’s interests. A student pursuing a strongly interdisciplinary program may include in-depth study of more than one of these disciplines. Research Methods. Candidates for the Ph.D. must demonstrate competence in research techniques appropriate for both the disciplinary emphasis and area of specialization. Preparation in this field must include experimental design, sampling design, estimation, and hypothesis testing. Breadth Requirement. Each student’s program must include course work addressing human and ecosystem processes and the relationship between them. All students must complete the required core courses listed below. While in residence, doctoral students in the natural sciences must also complete one additional course in the application of social science to environmental problems; doctoral students in the social sciences must complete one additional course in the biological or physical sciences. The Guiding Committee will determine the level of the additional course based on the student’s background and experience. The course must be a minimum of two graduate units or three upper division undergraduate units and taken for a letter grade unless offered on an S/U or P/F basis only. Each doctoral student in ESPM will be required to take three core courses. ESPM 201A: Research Approaches in Environmental Science, Policy, and Management (3 units). ESPM 201C: Environmental Forum (seminar, 1 unit) To be completed or in progress at the time the Ph.D. oral qualifying exam is held. ESPM 201S: Environmental Science, Policy, and Management Colloquium (1 unit). Must be taken prior to the oral qualifying exam. ESPM 201S may be repeated for credit. Doctoral students will also be required to complete a minimum of 6 units in their Area of Specialization. The Guiding Committee and the student’s Graduate Advisor will approve the selection of appropriate courses to meet this requirement. Doctoral students are strongly encouraged to present the results of their research in an appropriate seminar setting in ESPM, the College of Natural Resources, or a closely related department on campus. The Graduate Advisor in consultation with the student establishes the three-member Guiding Committee early in the first semester of study. The Guiding Committee is usually chaired by the student's major professor, whose interests closely relate to those of the student. Other committee members are faculty whose interests represent the specific fields of emphasis for the student’s program. If appropriate, a fourth faculty member may also serve on the committee. Students should obtain a Ph.D. Guiding Committee form from Graduate Student Services, complete the form, and return it after committee members have been selected. The Guiding Committee’s role is to counsel the student throughout the period of study leading to the Oral Qualifying Examination. The specific functions of the Committee: (a) to help define the disciplinary emphasis which will best serve the student's academic interests, (b) to review the student's program proposals, (c) to recommend a specific academic program. The Guiding Committee should meet annually with each doctoral student until the Oral Qualifying Examination is held. At the time of the annual meeting, the student’s Ph.D. Program Form should be filled out. This form records core requirements and the student’s proposed courses and kept in the student’s file. The purpose of the qualifying exam is to ascertain the breadth of a student’s knowledge and preparation. The examination is conducted by a four-member committee appointed by the Graduate Division. A member of the ESPM faculty serves as chairperson; at least one other member of ESPM and one UC Academic Senate member from a separate department in the university are also on the committee. The Guiding Professor may attend the exam but may not serve on the committee or participate in its deliberations. The student is expected to demonstrate a broad knowledge in the program of study. In-depth questions will test the student's ability to integrate the various elements of the program. During the first part of the exam (approximately 30 minutes) the student will present and discuss his/her intended dissertation research project. The qualifying exam is usually between two and three hours in length. Ph.D. students should use the Application for Candidacy for the Doctoral Degree Plan B (from Graduate Division web site or Student Affairs Office) to apply for candidacy. Students are expected to complete all work necessary for formal advancement to candidacy within three months after the completion of the Qualifying Examination. A dissertation title and proposed committee must be submitted for approval at the time of advancement to candidacy. In consultation with the Guiding Professor, the student will select a dissertation title and identify at least two additional dissertation committee members. One of these must be a member of the Berkeley Academic Senate from outside ESPM. Obtain the necessary signatures and bring the form to the Student Affairs Office. The form should be filed no later than the beginning of the semester following the one in which the student passed the qualifying examination. Once a student has formally advanced to candidacy by the Graduate Division, the department is sent an individualized Final Report form. We certify on this report that all coursework for the degree, besides the filing of the dissertation has been completed by the student. This report is signed and returned to the Graduate Division and a copy is kept in the student file. The Graduate Division requires that all doctoral students who have been advanced to candidacy meet annually with at least two members of the Dissertation Committee. The student must complete the online Academic Progress Report annual to collect data on what progress he/she has made toward the degree and what remains to be completed. An electronic copy of the Academic Progress Report is submitted to the Guiding Professor and Graduate Division and must be on file for each year the student has advanced. Normative Time is the calendar time, in semesters, recognized by the Graduate Division as the length of time normally needed for completion of the doctoral degree. Normative Time for the ESPM program has been set at ten semesters and is calculated for each student from the first semester of enrollment as a graduate student. As of September 2003, following successful completion of the Qualifying Exams, graduate students with parenting demands will be granted an extension of up to one extra year toward Normative Time completion. Extensions for parent considerations cannot exceed two years overall, no matter the number of children involved. Filing Fee status is used in lieu of registration for the semester in which you either file your dissertation or thesis, or take a comprehensive exam. Filing Fee is a non-registered status, which means you are not allowed to use University facilities. The amount of Filing Fee is one-half of the Student Services Fee(formerly the University Registration Fee. The deadline to apply for Filing Fee is the last day of the first week of instruction for the semester you wish to file. Filing Fee period lasts until the last day of the semester. For more information, see Graduate Division web site, Frequently Asked Questions. Candidacy for the doctorate is of limited duration. When students are advanced to candidacy, the Graduate Division informs them of the number of semesters that they are eligible to be candidates, based on their major’s Normative Time. Lapsing is a probationary status, usually lasting two years, for students who are not completing the final degree requirements at an adequate rate. The Head Graduate Adviser may request an extension of a student’s candidacy if the student is otherwise making adequate progress and if the delay can be attributed to factors largely beyond the student’s control. In absentia registration is available when you are a full-time regularly enrolled and registered student who has an academic need to conduct research outside of Califonia for a period of up to one year. The student must have advanced to candidacy by the time the inabsentia status begins. The student will pay 15% of the tuition and 100% of health insurance, non-resident tuition, and professional degree fees.